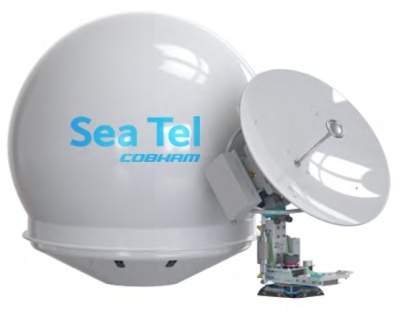 The SeaTel 4012 GX is a new Ku-Band antenna that can be easily upgraded to Ka Band when the Inmarsat Global Xpress system comes online. The antenna is based on the successful 4009 antenna with sophisticated shock and vibration damping for the most severe sea conditions. The complete RF package, including the BUC and copol and xpol LNBs are housed in a module directly behind the feed. The feed horn attaches to the OMT through a hole in the center of the dish. To upgrade to Ka-band one would simply remove the feed horn, remove the RF module and replace both with the Ka band module and feed, which will be weighted to match the Ku module to simplify balance requirements. This can be done in the field, by a SeaTel trained technician in as little as 30 minutes. The pedestal control unit (PCU) in the antenna has been replaced with a new Integrated Control Unit (ICU) which will contain the tracking tuner in the radome, and the old Digital Antenna Controller (DAC) will be replaced with a Media Exchange Point (MXP) that will provide the user interface in the rack below deck, like the DAC of previous models. The radome is spherical as high frequency Ka-Band beams are easily refracted when passing through the radome skin at an angle. The spherical shape keeps the beam circular. The cylindrical lower portion of a traditional dome would distort the shape of the beam as the antenna comes down in elevation, whereas the beam from the spherical dome is constant at all angles of elevation. Matching spherical TV antenna domes will be available for uniformity on new installations. 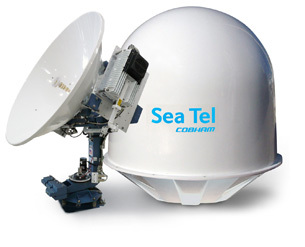 The most common VSAT terminal on yachts and ships is the 1 meter SeaTel Ku band 4003, 4006, 4009 and 4010. These provide service using iDirect, Hughes, NSSL or Comtech modems. The first two digits of the model numbers indicate the approximate size of the dish (40 inches - 1 meter) and the last two digits indicate the year that model first began production. For larger vessels these antennas are available in 1.2 meter and 1.5 meter models such as the 5009 and 6009. These larger antennas are suitable for vessels requiring higher bandwidth or routinely travelling toward the edge of the satellite footprints. A 1.2m antenna is 44% larger than a 1 meter, and a 1.5m is more than twice (2.25x) the area of a 1 meter antenna. SeaTel Antennas are manufactured in Concord, California. 25164 visits to this page since 28 Nov 2012.